An American surgeon works amid the relics of war on Guadalcanal. The downwind approach of my Boeing 737 into Honiara International Airport goes over Iron Bottom Sound, with Savo Island off in the distance. Below are the rusted remains of two Imperial Japanese Navy transport ships that ran aground on the northern coast of Guadalcanal in November 1942. On final approach, the plane glides over World War II battlefields now converted into squatters’ camps built of wood, tin, and grass. The white triangular battlefield marker at Bloody Ridge is visible as the plane settles onto the runway. There is one taxiway at the airport and the rusted old control tower built in 1943 is still standing along its western side. Honiara International Airport is Henderson Field, the very airstrip the Guadalcanal campaign of World War II was fought over. The runway is paved now and it has been extended to allow larger jets, like the 737 I arrive on, to land. I travel to the Solomon Islands three times a year. I am a doctor, a surgeon. I work in the Solomons because there is only one doctor for every 18,000 people. Outside the capital, Honiara, located on Guadalcanal, there is virtually no surgical care available. A child with appendicitis must travel hundreds of miles by boat to get surgical care. Even in Honiara at the country’s main hospital, the National Referral Hospital (NRH), there are backlogs of patients waiting for surgical treatment. 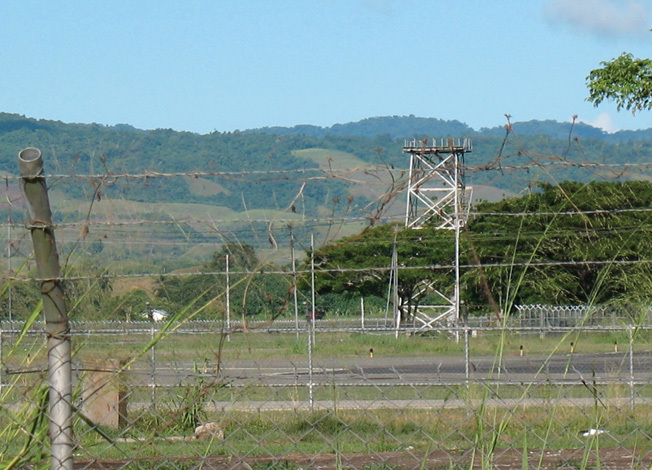 The skeleton of the Henderson Field control tower, built in 1943, sits on the edge of the runway of what is now known as Honiara International Airport. NRH is the old 9th Army Field Hospital, and some of its buildings are left over from World War II. The walls are crumbling and the electrical wiring and plumbing are falling apart. Open sewer drainage ditches run between the hospital’s buildings and ultimately empty directly into the sea. There are three surgeons providing surgical care for the entire country. There is no intensive care unit for critically ill patients, no CT scanner, and limited surgical supplies. In 1942, nearly every American could tell you where the Solomon Islands were located and why they were important to us. Some of the fiercest and most savage battles between Allied and Japanese forces were waged on land, sea, and air throughout these islands. Over time, and with the accelerating loss of many of our World War II veterans, most Americans do not even know this small island country exists. I first heard of the Solomon Islands as a child during family gatherings. My mother’s oldest brother, Billy, went there while serving in the Navy during World War II. Billy was killed in action when his ship, the heavy cruiser USS Quincy (CA-39), was sunk during the Battle of Savo Island. While my mother and her brothers and sisters would mention Billy, my grandparents would not speak of him. The pain they felt at losing their eldest son was deep, and the lack of information surrounding the battle in which he was lost left them bitter. Billy’s Purple Heart medal, awarded posthumously, was stored in the very back of a dresser drawer out of my grandparents’ sight. All those years growing up, my cousins and I knew of our uncle Bill, but we never really knew who he was until 2004. 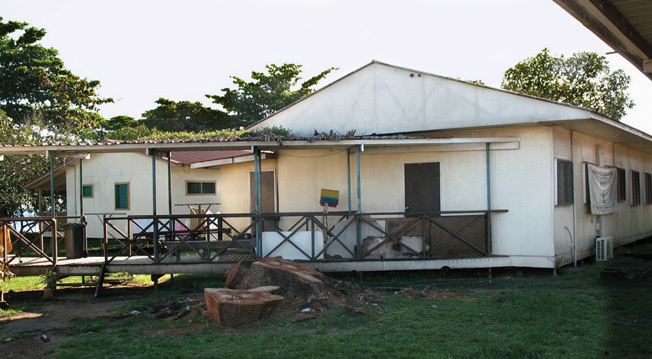 Formerly the 9th Army Field Hospital, this clinic building located on the campus of the National Referral Hospital (NRH) at Honiara is a relic of the American occupation. Most of the hospital was built in 1950 with funding from the Republic of China, Taiwan. I made my first trip to Guadalcanal and Savo Island in 2004. I tacked the visit onto the tail end of a surgery teaching trip at the Fiji School of Medicine. This teaching trip was a part of the Loloma Foundation’s academic exchange program. When my aunts and uncles heard I was going to visit the site where their brother Billy died, they asked me to deliver a memorial capsule into the waters of Iron Bottom Sound over the Quincy where Billy is entombed. They filled this capsule with some very powerful and emotional letters written by each of them. The letters were frozen in time: 1942, when they last saw him. As a result of these letters, and this memorial service, my family now talks more openly about Billy. We shared his last letters home and even the telegram the Navy Department sent to my grandparents. 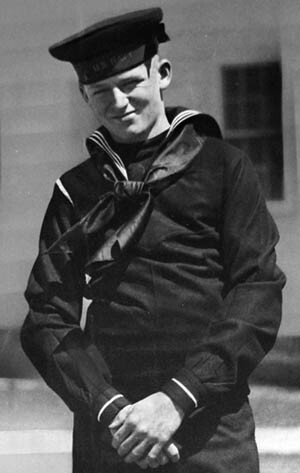 The author’s late uncle, Apprentice Seaman Billy Stack, photographed in April 1942 at the Newport (Rhode Island) Naval Training Center. Stack and his boot camp colleagues pooled their money and bought the Brownie camera used to take this picture. Billy was born in Ireland and immigrated to the United States when he was four years old. He came from a long line of Irish Republican soldiers who fought for Ireland’s independence. When Pearl Harbor was bombed, Billy, like most young men, announced to the family that he wanted to enlist. On his 17th birthday in February 1942, Billy persuaded my grandparents to sign him into the Navy. After a month of boot camp training at the Newport (Rhode Island) Naval Training Center, Billy was assigned to the Quincy as a gunner’s mate and was stationed on one of the newly installed 20mm Oerlikon cannons on her aft superstructure. 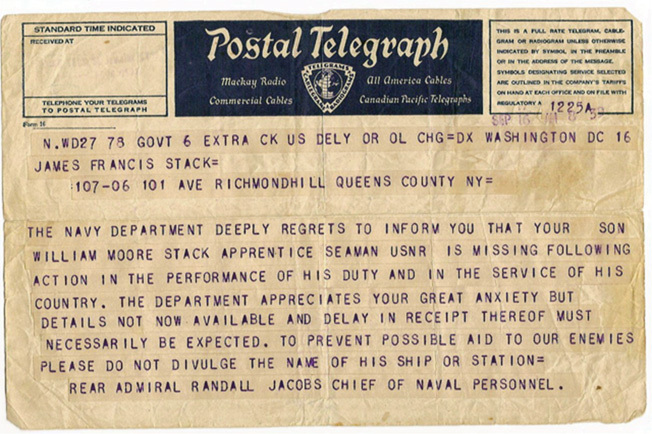 The Navy Department telegram sent to the author’s grandparents more than a month after Billy Stack died in the Quincy’s sinking. Her grandparents were frustrated by the lack of information about what happened to their son. The Quincy joined other ships in Operation Watchtower and sortied to Guadalcanal. In the early morning hours of August 9, 1942, Gunichi Mikawa’s Japanese Navy Eighth Fleet sank the Quincy, Vincennes, Astoria, and Canberra, killing 1,077 men, including Billy. Since my 2004 trip to Solomons, I have been working with the Loloma Foundation, taking teams of doctors and nurses to Guadalcanal and the outer islands where 80 percent of Solomon Islanders live. We provide much-needed volunteer medical and surgical care as well as equipment. I was not a World War II buff before my first trip but I have become one now. It is virtually impossible to ignore the World War II history we work among, and after every trip I find myself researching the history of the area we visited. Leftover World War II debris is evident all over the islands. It is remarkable how rusting hulks have been reprocessed into the daily lives of modern Solomon Islanders: Marston matting that once formed airfield runways is now used as fencing, and Quonset huts as business warehouses. In Taroaniara, at Lyons Point near Purvis Bay, the clinic building we worked in was the original Solomon Islands WWII Navy Headquarters. The huge, beached bow of LST 342 is located nearby, hauled there from the Kula Gulf. Traveling from island to island to provide surgical care, we have touched down on historic airstrips––like the Seghe fighter airstrip, built in just 10 days by the 47th Naval Construction Battalion Seabees, and the Munda airstrip, built by the Japanese but taken by Allied forces in August 1943 during the New Georgia campaign. Although covered by a patina of rust, this 6-inch Japanese coastal defense gun, one of four guns at Enogai inlet on New Georgia Island, still looks lethal. Posing on the gun is Ken White, a Navy Corpsman Reservist and OR technician working with the Loloma Foundation. Our team has treated hundreds of people in Tulagi, Savo Island, and the Russell Islands, including Puvuvu, the site of the 1st Marine Division’s rest camp. In the western portion of the country, four Japanese 6-inch coastal defense artillery guns are still positioned on shore at Enogai inlet, looking, despite the rust, as ready for battle as they did back in 1943. On the edge of a Bairoko Harbor village, there is an M3 Stuart light tank that is remarkably intact. While working on Guadalcanal, we have crossed the Matanikau and Lunga Rivers. We have provided surgical care at a small hospital on the edge of Tetere where children play soccer among hundreds of amtraks that once carried Marines to shore. 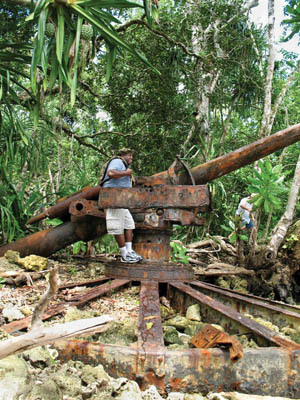 Having World War II relics located in a Solomon Island village is like gold for the people of that village. It allows them to charge visitors a custom fee of between $5 and $10 U.S. to see the wrecks. These custom fees are used to cover educational and medical expenses for people living in the village. But leftover war relics can come with a steep price if they are unexploded ordnance. Many an arm, leg, eye, and even life has been lost when the bombs and shells and other munitions explode while their gunpowder is harvested for use in reef fishing or when one is dug up accidentally. When our medical team arrives in a village or hospital to work, the people of the Solomon Islands welcome us. They are happy to have doctors––especially surgeons––there to treat them. They are also happy to know that the Americans are back again. Many of the older villagers remember bikfala faet. They worked as scouts with the coast watchers or as members of the Labor Corps. They are proud to tell us of their experiences working with Allied forces. The diseases and maladies that Solomon Islanders suffer from present in advanced stages. What we are seeing is the natural history of disease untreated. Breast, ovarian, lung, and laryngeal cancers are on the rise, as are diabetes and heart disease. Children have a spectrum of congenital anomalies such as an untreatable encephalocele and cleft lips. And then there is malaria. Ironically, the very same disease that plagued our Marines during World War II still plagues modern Solomon Islanders today. More than 30 percent of islanders have the disease at any given time. 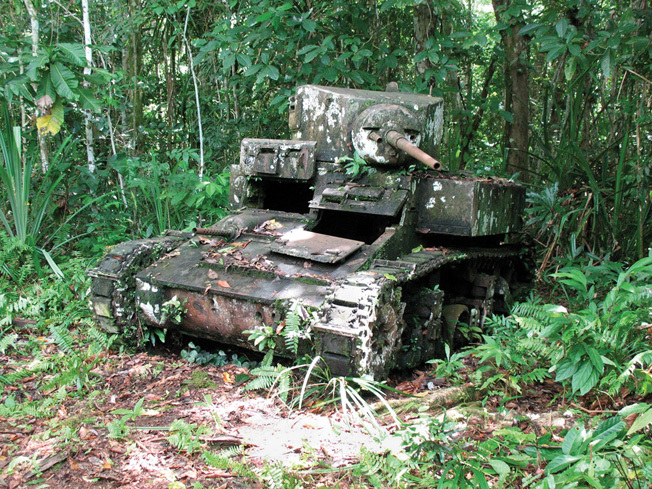 The rusted hulk of an M3 Stuart light tank is slowly being reclaimed by the jungle on the edge of a Bairoko Harbor village, New Georgia Island. The Pacific Malaria Initiative oversees the current eradication program. Today Coartem has replaced the Atabrine that was used to treat malaria during the war. Despite improved drug therapy, children still die from cerebral edema secondary to Plasmodium falciperum infection. Children die from diarrhea and dysentery as well. People suffer from filariasis, leprosy, and tuberculosis. A young girl paralyzed from the waist down was brought into our clinic on Savo Island. She had a form of tuberculosis known as Potts disease. The TB bacteria had eaten away at her vertebral bodies, causing them to collapse and compress her spinal cord. We initiated antibiotic therapy and transported her to the NRH. We have provided surgical care for hundreds of Solomon Islanders during our visits. Some patients are lucky that their surgical emergency happens when we are there to treat them, like the 28-weeks pregnant woman with appendicitis, or the woman pregnant with twins, one breech, who needed an emergency C-section. I feel good about helping those patients, but it is the people who need emergency lifesaving surgery when we are not there who worry me. To solve the problem of surgical access, we have begun training Solomon Island doctors in surgical techniques. We have established a teaching partnership program in which U.S. specialty surgeons travel to Guadalcanal and teach skills and new techniques to the three talented and hardworking surgeons at the National Referral Hospital, as well as the doctors working in the remote provincial hospitals. 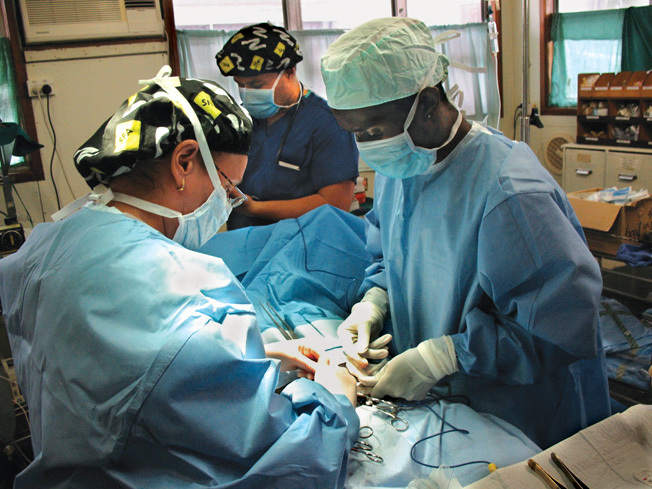 One of the Loloma Foundation’s missions is to teach local doctors to perform surgery. Here the author (left) instructs Dr. Andrew Soma in a hernia repair. There are 75 Solomon Island medical students currently studying at Cuban medical schools. They will graduate in 2013 and will return to the Solomon Islands to obtain postgraduate training. We are working with the Solomon Islands Ministry of Health on establishing training sites for these graduates at some of the country’s provincial hospitals. These locally trained doctors will improve medical and surgical care in the provinces and create sustainable solutions to the health care shortage. We are also working toward improving the infrastructure of the hospitals and introducing new medical equipment that has been generously donated by Stryker, Olympus, Gore, Sonosite, Abbot Point of Care, Direct Relief International, and Professional Hospital Supplier, to name a few. Loloma Foundation is one of the only American organizations providing medical and surgical care as well as training consistently in the Solomon Islands. Nearly all aid to the country is provided by Australia, the Republic of China, Taiwan, and Japan. The United States government provides virtually no health care assistance to the people of the Solomon Islands today. In a small way, I see the work we are doing as a way to reconnect with a country that has shared history with us. American soldiers had a positive impact on Solomon Islanders. While assisting our troops with reconnaissance, loading and unloading supplies, and even carrying the injured and dead off the battlefields, Solomon Islanders changed. A man named Billy Alli, a former scout, put it succinctly: “U.S. soldiers showed us how white men and black men could work together as equals. American soldiers made us feel important.” This feeling of being valued and respected helped Solomon Islanders to organize the Maasina Ruru or Marching Rule Movement, which ultimately resulted in the country gaining its independence from Britain in 1978. 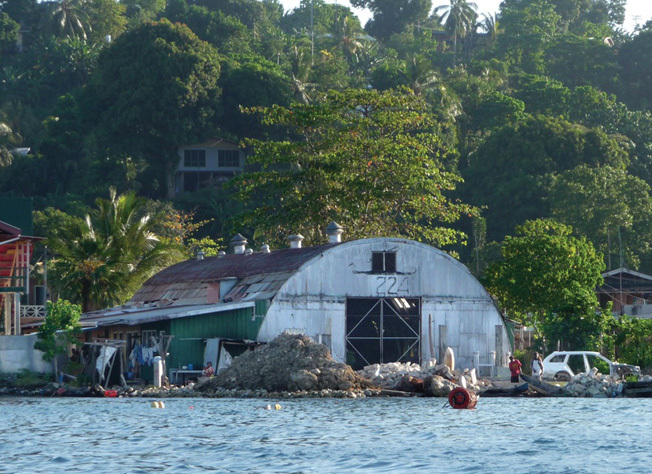 A Quonset hut from the war is now used as a warehouse on Ghizo Island, 236 miles west of Honiara. In addition to rekindling a connection with the people of the Solomon Islands, the work we do is a kind of “living memorial” to the men who served and to those who died in the Solomon Islands. Virtually every World War II veteran I have spoken with expresses the same concern: With time, what they did, and the sacrifices of those who never came home, will be forgotten. Our work is a way to keep their memory alive. The hard-fought campaigns on Guadalcanal and in the western Solomons are fast being forgotten. History can record these battles but, unlike the 6-inch steel guns that stand guard at Enogai inlet, our veterans are disappearing and so, too, are their firsthand accounts of the men left behind. In 2004, when I dropped the memorial capsule full of letters from my aunts and uncle to Billy, I thought about how Billy and some of his shipmates are entombed within the Quincy on the bottom of Iron Bottom Sound. While crossing Iron Bottom Sound on the way to Tulagi Hospital, I have tried to imagine what it must have been like in these waters nearly seven decades ago. These thoughts have stayed with me. Dr. Gerry Schneider, one of the surgeons who has worked with me in the Solomons, articulated beautifully what I have felt since 2004: “I feel uneasy and disturbed in the Solomon Islands, not just for the diseases and medical problems we see, but also because I sense the horrors that went on here 68 years ago.” On Guadalcanal and all throughout the Solomon Islands, the energy of the thousands of young lives lost can still be felt. 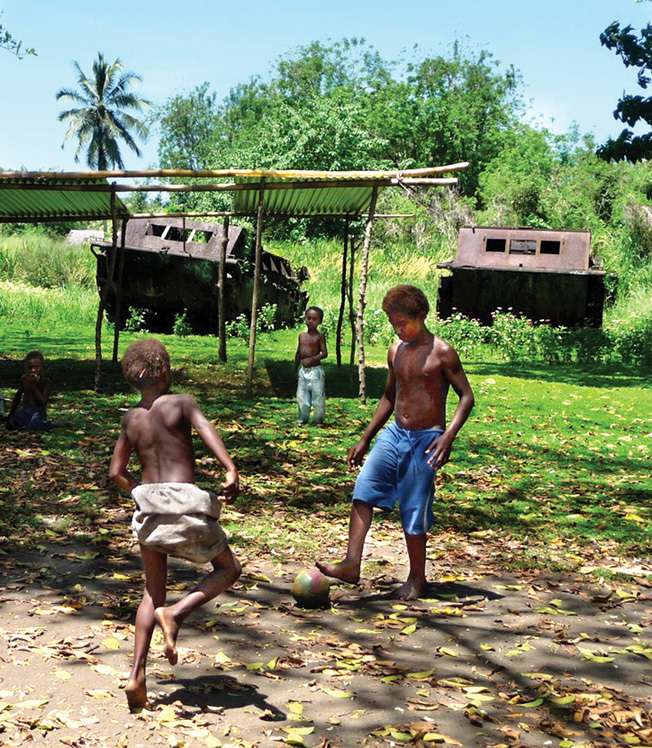 Two of over 70 amtraks left near Red Beach in Tetere appear to stand guard as Solomon Island children play soccer. As the result of my own family’s tragic loss, I volunteer my time working in the shadows of World War II history. I do it with profound respect for all those Americans who came here before me; who sailed the seas, landed on the beaches, and touched down on the airstrips during one of the most violent, yet unique, times in our history. I do it so they are not forgotten. But I also do it because the people of the Solomon Islands deserve a better health care system than they currently have. Tags Allies, Axis, Battle of Savo Island, Cactus Air Force, Eileen Natuzzi, Guadalcanal, Gunichi Mikawa, Henderson Field, Iron Bottom Sound, Japan, Japanese, Loloma Foundation, seabees, Solomon Islands, Tulagi.